Finally got the big Easy Street reveal and now I understand why some people wait for the reveal before they pick their colors, color placements, etc. Alright...stil not feeling it, but I'm going to go ahead and audition a border--maybe that will make a difference? OFF TO MINGLE...HO HO HO!!! 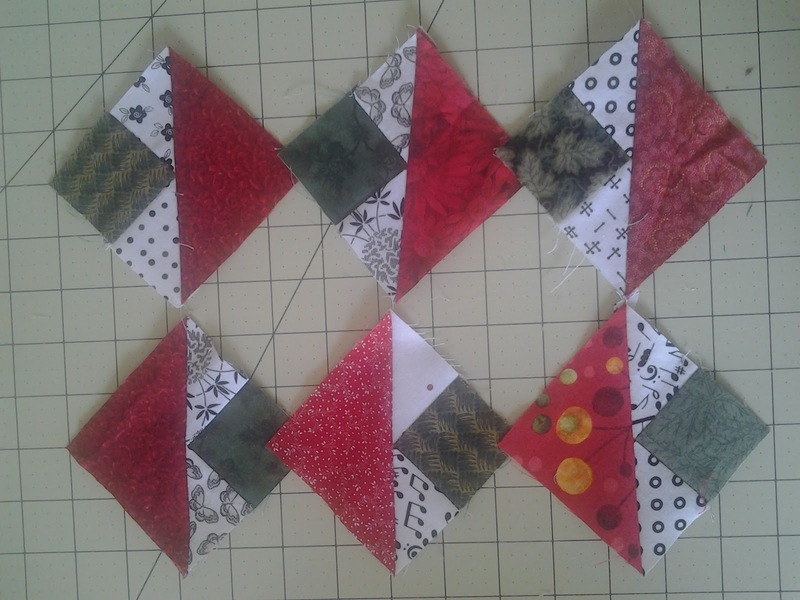 Tonight is momentous...I am going to a Christmas quilt guild meeting! The lone wolf quilter is looking for a pack at last. On the schedule for tonight is a potluck dinner, gift exchange and a speaker. I will finally meet real life quilters, flesh and blood folks who might be as obsessed as I am. It would be nice to know I'm not all alone. I mean, I know all my cyber-quilting friends are "real", but sometimes its just not the same, you know. My contribution to the potluck is a blackberry cobbler, my Granny Clarke's recipe. 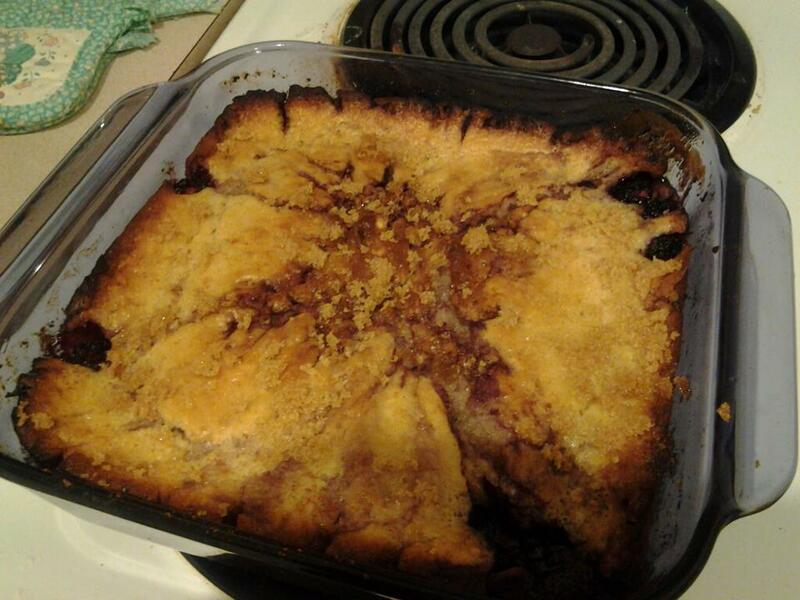 It's what we call a the "One Fruit Cobbler", i.e. one stick of butter, one cup of flour, etc. It is probably one of the most delicious desserts around. Granny's motto was to KISS her food (keep it simple, silly) and it really works for this cobbler. 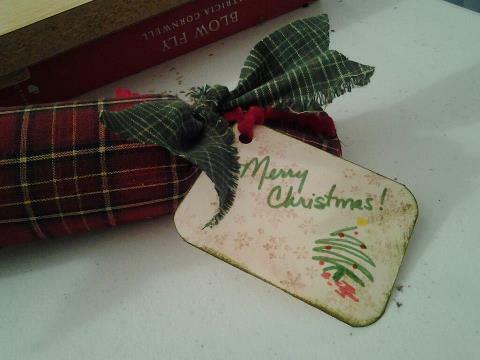 My gift is Triangles on a Roll--wrapped in a Christmas plaid homespun fat quarter...I actually parted with fabric...it can be done. ALERT THE PRESSES! I'd like to have it, so I figured other people would like it too. Looking at my package, I understand one of the reasons I enjoy being crafty: its so things look like I want them to look. Glossy, sleek, polished--its not me. I like things home-y, crafty, warm and approachable...I want what I give people to have a tiny piece of me in it. So it's off to be social, I am. I'm NOT unsociable, I'm just a little shy at first but sometimes I appear to be stand-offish so I don't get approached which makes me more stand-offish...vicious cycle. Let's hope this is a win, because I need friends who like to do what I do. Sara's quilt came back from The Quilters Touch so it's binding time. I've got my tiny applique needles, my lavender thread, my boyfriend's younger eyes (for threading) and THE VOICE! I finished Allyson's a few weeks ago during the Battle Rounds and time just flew. Who knew that multi-tasking would be so awesome? 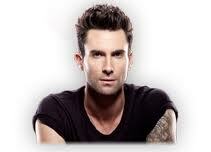 Adam Levine is quite possibly the yummiest thing around. 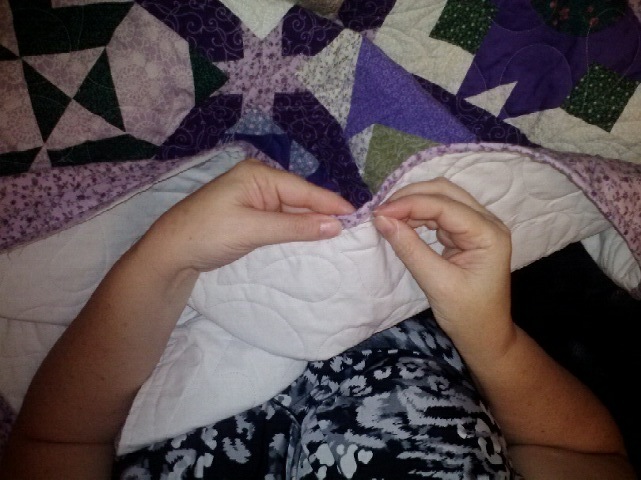 There is something very Zen and calming about binding a quilt by hand. Once I get in the zone, its one of the most relaxing things around. Of course, I hate asking Matthew (boyfriend with younger eyes) to thread my needle all the time, but something about that tiny needle eye and the lavender thread just isn't working for me. I've even got my reading glasses on, but I can't thread that darn needle! It's a good thing I sew mostly by feel or it could be a mess. It's hard to believe that Sara's Sampler is almost done. It's been folded up in a Rubbermaid tub for about 10 years. I don't know why I never had it quilted...time, money, sadness at its being done and my baby being a big girl...who knows? She and her sisters have been hammering on me pretty hard the last year or so to get their quilts out of the tub and onto a bed, so I have two down and only Katelyn's square in a square to get quilted. It's a wonderful feeling of completion to have them done, but also a little sad, but I can't explain why. Maybe its the end of a chapter? Well, anyhoo, theirs may have taken over a decade to get done, but Baby Weston's I-spy was pieced, basted and practically quilted in a month. 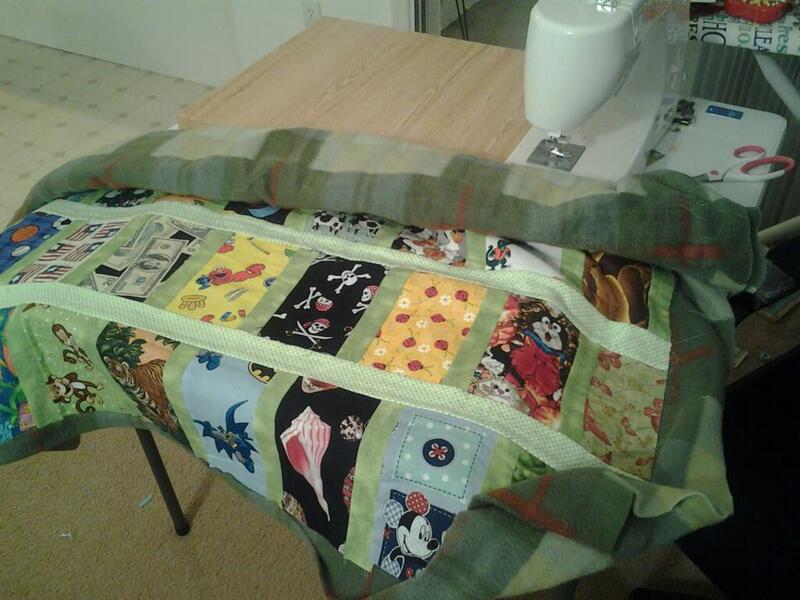 If Godzilla hadn't mutinied on me yesterday, I would be binding his quilt instead. Motivation is the key! Easy Street, Part 3 is done! I was a little squeamish when I saw that it was a shaded 4-patch because I was still reeling from the aggravation of the Flying Geese. Angles of any kind have never been my friend when it comes to sewing. For some reason, they just never come out right. I tried the no-waste method with the Geese and was semi-successful but still frustrated at the amount of work and lack of satisfaction with my finished product. I decided to try the same method with the Shaded 4-patch and BOY! Was that a joke (for me at least)! Ended up putting 1/2 the units in the crumb bucket. Soooo....I re-read Bonnie's tutorial again about the Easy Angle & Companion Angle and skimmed over a few more of her blogs where she mentioned that she finger-pressed her seams by scraping her thumbnail down. These two things plus another blog (can't remember where I saw it) which showed how to chain piece the second side of the wings made it a thoroughly satisfactory Saturday, sewing wise. I can't believe I never figured out how to chain-piece the second wing units just by flipping them upside down. What a dork I am! I went back to the Flying Geese and employed the thumb-scrap method to them too and they worked out as well. Yay! Sad news though...Godzilla has had enough. Godzilla is my vintage Elite, a Japanese Singer knock off, circa 1951, He finished Easy Street and then said "Watashi wa dōsa shimasen" which is "I will no longer work for you, you slave-driving wretch" in Japanese. So its off to the shop with him and my Christmas gift projects are at a standstill because I only had the one working machine and I gave my loaner back to her Momma because she (Momma) was going through withdrawal. But I'm still on the path to Easy Street! A few weeks ago I decided to make my 2 year old DGS an I-spy quilt...I combed through websites, blogs, etc and finally stumbled on the Happy Child Quilt pattern by Villa Rosa Designs...perfect! I ordered it immediately, then went to work gathering novelty fabrics appropriate for a 2 year old boy. I had more in my stash than I thought, though no idea how they got there, but a few trips to Joanne's and Wal-Mart set me right up...except for one thing! I had no idea what size blocks they were since I didn't have the pattern yet, so I winged it. Being an extremely frugal (read cheap) person, I bought 30 (yes 30!) different fabrics all at 6" x WOF each. When the pattern came, darned if they weren't supposed to be cut at 8"...so there I was, too short. A lot of them I could just flip, but quite a few were direction sensitive...poo. Anyhoo, I got creative, managed the design enough to suit my fussiness and sewed happily away. About 1/2 way through the process, I realized that I do not care for novelty or I-Spy designs. They offend my sense of order! But my new MO of late has been to break out of my box and "wing it" when it comes to design, color, etc. 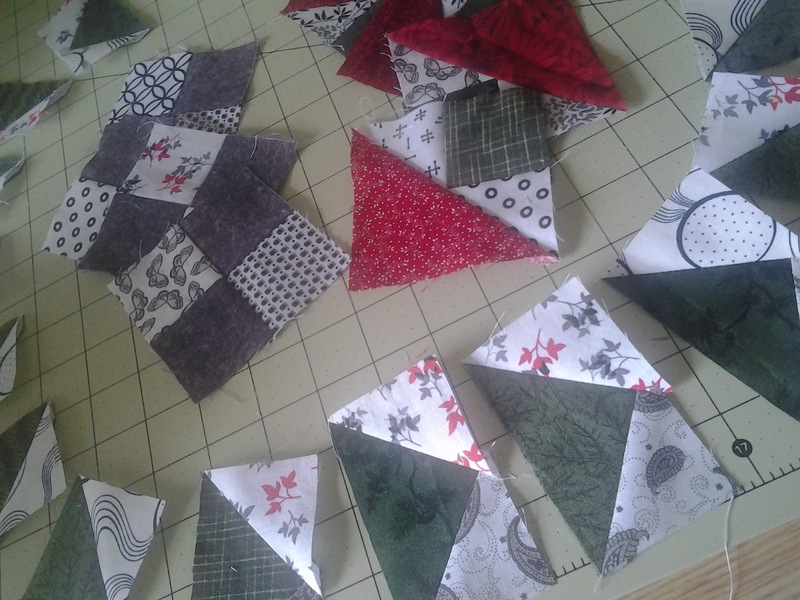 I'm trying wonky quilt blocks, crumb and strip piecing and major scrap busting in making new blocks. 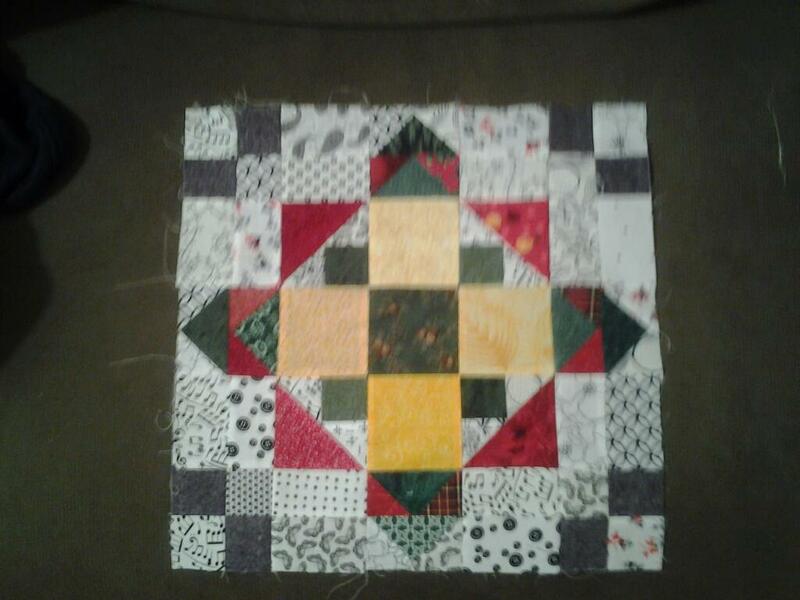 So it's been cut and pieced and I'm in the process of quilting it myself. 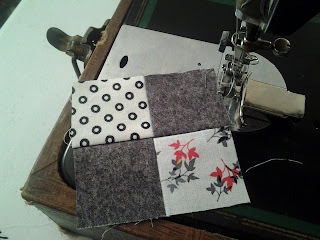 Some of the free-motion quilting is a little wonky, but this is only the second one I've done myself and this Kenmore sewing machine isn't the best for that. I'm getting better as I get closer to being done, but you can certainly see my progress thoughout the quilting. 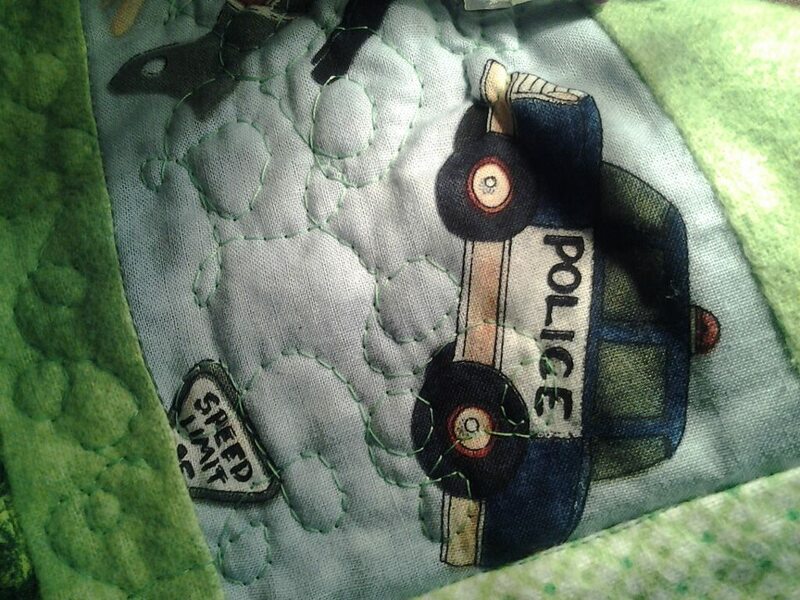 The quilt is almost done and its actually going to be perfect for my little man. Is it a Paducah-quality masterpiece? Not by any stretch of the imagination, but it is perfect for a little guy who likes soft, colorful things that he can also play I-Spy with his Mommy on. I'm going to play quick catch up with the whole blogging/linky thing--I'm doing Christmas colors for my Easy Street (think Miracle on Easy 34th Street as the tentative name), still keeping grey and b&w for my background. I had almost everything in my stash except the black and white, which was harder to find than you'd think...but here we are! It has many brothers, but for some reason, I can't get the pics on my camera to load...so here's a phone shot! 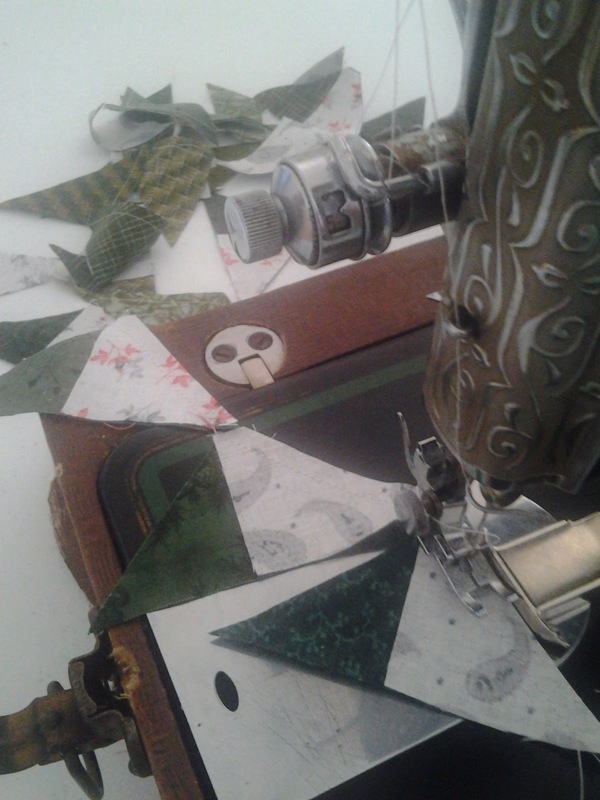 Creativity gives me joy, whether it be sewing, scrapbooking, writing, composing, cooking...whatever.--Why? Because I can...LOL, no really...it's because I'm driven to create something, anything. The only problem is that I'm a process junkie. It's never been the destination when I'm in the throes of whatever muse has me by the throat, its the journey. Which is why I have so many flimsies, UFOs, partial scrapbooks, snippets of prose and song lying here and yon. I'm okay with that BUT my family isn't. They want their quilts and their scrapbooks and their cook books, etc., and they're tired of waiting. 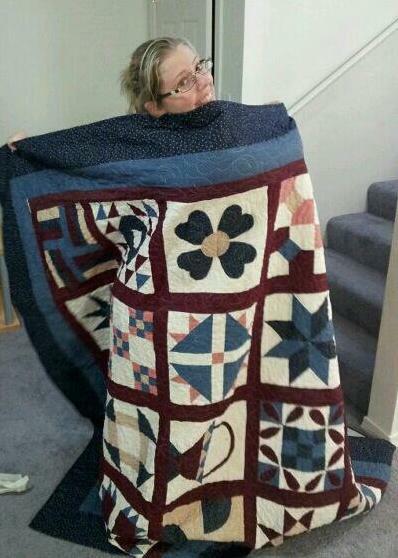 While surfing the web to find a longarm quilting service, I stumbled across Bonnie Hunter's Quiltville. Her string piecing tutorial looked fun, so I bookmarked her and went about my business. Then I was trying to figure out how to size setting triangles for a quilt I wanted to set on point...Google took me back to Bonnie. Ways to organize my stash? Bonnie again! 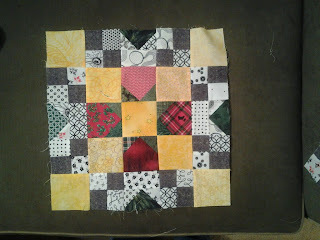 I had kind of given up on the quilting thing for a while until I found the website. The Easy Street mystery caught my interest and I decided to go through my fabric again and OH! the flimsies I found. 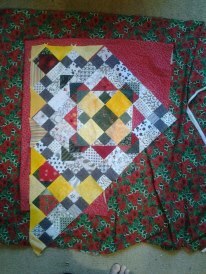 I decided to buckle down and start sending the flimsies out for quilting. I found a wonderful long arm quilter, Debra Pugh at the Quilters Touch in Missouri who isn't fussy if every seam isn't straight and pressed or whether the border was obviously sewn by a beginner. 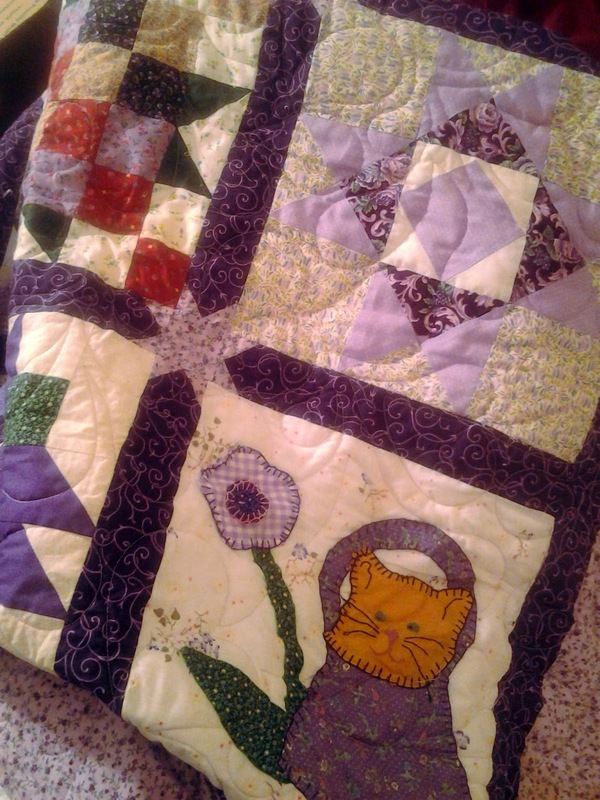 She thinks every quilt deserves to be quilted and she did a marvelous job on my first two. My goals for 2013 are to have all the flimsies quilted, join a guild, attend some classes and get rid of all my crumbs and strings. Along the way, I'm going to do mysteries, blog and keep enjoying the process with maybe a FEW products to show for it.